In light of recent erroneous claims from the real estate industry that real estate has averaged an 11% return over the last 25 years (it has actually averaged 5.3% before accounting for inflation), we thought we should provide a little more information about real estate as an investment. Especially since, for most people, their home is their largest single asset. The links, below, show that if you invested in real estate 17 years ago during the 1990 real estate bubble, your returns are barely breaking even. The US housing market is even scarier. As with the other markets, timing is important. We certainly believe in owning your own home, for security and for peace of mind. But please don’t think of it as an investment or growth vehicle. It is a place to live. The theoretical return you get on it is the rent you would otherwise pay to live in a comparable property (less the interest costs on your mortgage, of course). While your home's value can yield about 3% after adjusting for inflation, your costs of home improvements, annual taxes, insurance and other expenses generally exceed 3% a year. This makes the MERs on your mutual funds begin to look like a bargain, especially in light of the higher returns over 10, 15 and 25 year time horizons. Now some would say in light of this, that you should clearly borrow against your home to invest in the markets. You could even make your mortgage tax deductible. We don’t necessarily share that view due to the increased leverage and risk involved. However, we do suggest that saving in your RRSP is a higher priority than paying down your mortgage, and we would be pleased to look at the pros and cons of investing outside your RRSP if you want to look at higher growth vehicles like some of our real estate mutual funds. 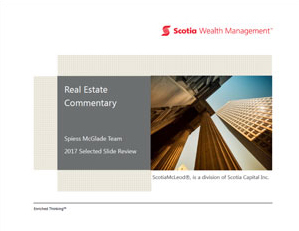 For personalized recommendations on real estate funds for your portfolio, contact The Spiess McGlade Team.